If you're still undecided about what to make for Thanksgiving dinner, then shame on you! Whether you're just looking for the very best way to make your family's tried-and-true or you want a brand new dish to spice up tradition a little, there is absolutely no shortage of ideas and possibilities out there, be it from magazines, television, cookbooks or the thousands of food blogs and food sites that are tempting us! I don't think I've ever seen so many good things to choose from.as I have these past few weeks. It's overwhelming! Pumpkin, squash, Brussels sprouts, beans, cranberries, sweet potatoes, veggies and desserts galore! Roast at a high temp. No, go slow, Stuff, don't stuff. Breast up, breast down. Baste a lot, don't baste at all. Try deep frying. Put it on the grill. Yikes! Have to admit, I have tried a few experiments that veered from the good ol' fashioned way my mom taught me: "Stuff the bird, put it in a 325 F. oven for four to five hours, baste every half-hour or so, tent it with foil when it gets too brown. It's done when the leg moves easily from the body. Let it rest while you make the gravy. Don't forget the giblets." And none of them really made a whole lot of difference until I tried brining. Soaking the bird in a salt/sugar solution for a day really does guarantee moist meat throughout. It just means planning further ahead, making sure you have either the fridge space to keep it cool, or a big enough cooler, and plenty of muscles to hoist that baby around. But it is a bit of extra effort. But Thanksgiving is just once a year after all. I'm not hosting the big feast this year and, because I'm a bit selfish, I wanted to be sure Mr. Rosemary and I had turkey sandwiches next weekend. And, of course, I'm a cook who enjoys experimenting. So I set myself to brining. I had brined a chicken once before -- with great results. Now it was the turkey's turn. After all the reading I did, I turned to two trusted blogs: Dara from Cookin' Canuck and Linda from Ciao Chow Linda. Both provided excellent blow-by-blow instructions. I used Linda's brine and Dara's roasting how-to. And we had one great turkey. Moist and tender meat throughout, even all the white meat. Nice mahogany glaze. A success. It was a 22 pounder (all for Mr. Rosemary and me!) so I made several freezer packs of meat and a few containers of stock. It's comforting to know the freezer's well-stocked. The verdict? Brine! I have to admit brining assures a moist bird. I'm not sure Mom would agree it was worth the extra work, but I bet she would have liked it. So . . . . how are you cooking a turkey this year? The day before (or night before) you want to cook the turkey: Using a 5-gallon bucket, line it with a plastic bag. Put the salt, sugar, onion, herbs and spices in a pot on the range with only two cups of water taken from the one gallon of water called for in the recipe. Bring to a boil and stir everything to blend the flavors. Remove from the heat and add some ice cubes to cool it off, plus about half of the remaining water. Put the thawed turkey in the plastic bag in the bucket and add the water and herb mixture. If the bucket needs more water to cover the turkey, add it now. Here's how Linda keeps the turkey (I kept mine in a covered cooler, well-iced in the garage): Since I can't fit the bucket into my refrigerator, I always place it outdoors on the deck, adding ice cubes to the water to make sure it stays cool. It's never been a problem here in New Jersey in late November, and sometimes it's gotten so cold that the top layer of water has frozen. I don't want to take any risks though, so I always add the ice cubes. Twist the top of the bag and secure it closed. To keep squirrels or birds from pecking into the bag during the night or before it goes into the oven, place a flat baking pan on the top and weigh it down with something heavy. Let it sit overnight and soak. The next day, drain the turkey from the liquid before roasting. Pat dry, then place your hand between the skin and the breast meat and spread some butter inside with some sage leaves. Alternately, make an herb butter, mixing some softened butter with minced sage, rosemary or other herbs. Preheat oven to 350 degrees F.In a medium-sized bowl, mix together softened butter, sage, thyme and parsley until well combined. Remove the neck and other innards from the turkey cavity. Season the cavity with salt and pepper. Place the carrot, celery and onion quarters into the cavity of the turkey.Tie the turkey legs together and tuck the wings underneath the turkey, using small skewers to secure, if necessary. Place the turkey in the roasting pan, breast side up. Scatter the shallots around the turkey, on the bottom of the roasting pan.Cover the breasts with foil and place the turkey in the oven. Roast the turkey for 2 hours, basting it with 1/2 cup chicken broth every 30 minutes. 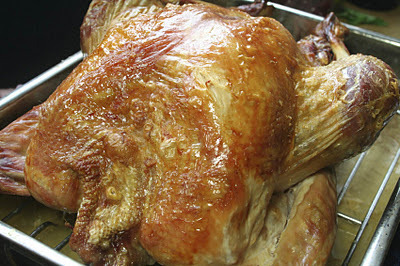 Remove the turkey from the oven, transfer it to a platter, tent with foil and let rest for 20 minutes before carving. Remove the carrot, celery and onion from the cavity and discard. Remove the shallots from the pan and serve with the gravy. Use the remaining brown bits on the bottom of the pan and the remaining herb butter to make the gravy. I do believe that brining is the best way to go. I am one that is not too big on turkey basically because of the dryness. Your turkey here does look delicious and I like the blend of seasoning in the recipe above. Thanks for sharing this one and have a wonderful holiday with family and friends. I'm a briner! It does make a huge difference. This year I'm doing pork tenderloin and will save the traditional turkey dinner until the children are here for Christmas. I have one foot heavy in the brining camp for the most succulent turkey. I have always been intrigued about brining the turkey; thank you for all this info. We celebrated Thanksgiging last month, just the 2 of us and I made a couple of turkey pies and we will be enjoying one one your big day. Happpy Thanksgiving to you and Mr Rosemary! No bird cooking for me, we just do a breast this year since there are only a few of us. That first pic has my mouth watering. Wow, that is a gorgeous plate of turkey! I've never brined one (and am not in charge of the turkey this year), but I'll have to try it. I'll be making your Herb and butter turkey breast recipe again of course :) Wish me luck! I would go for the brined one..it looks so good! You did find two very fine blogs to create your meal with - kudos to them and you. I'll be doing herbs and butter as always - although Linda's brine has me reconsidering brine sometime this holiday season. I hope you have a delightful Thanksgiving with a table laden with delicious and grace. How am I cooking the turkey this year? 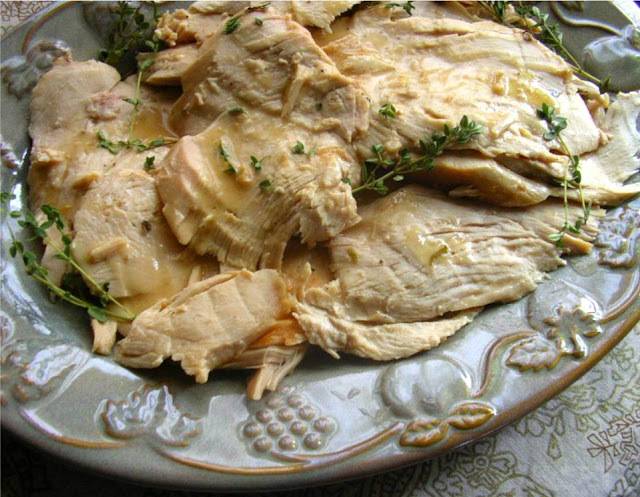 We don't celebrate Thanksgiving here, but I feel I ought to, just to experiment with brining - and I love turkey. Looks wonderful, Rosemary. Wishing you a Happy Thanksgiving. I'm intrigued by the idea of brining. I admit the only thing I've ever brined was pork chops. We had fried turkey at family's house yesterday and although I was anticipating a very moist bird, it ended up being overcooked. I think next year I'll brine at home just like you did and then I'll have moist turkey sandwiches instead of the dried out ones we're doomed for this year. Hope you and your family had a wonderful Thanksgiving Rosemary. Just found your blog. Love the name and colors. We traveled this year for Thanksgiving thus no leftovers. So...I'm making a Turkey tomorrow night because they are on a major sale! Using your brine, thanks!